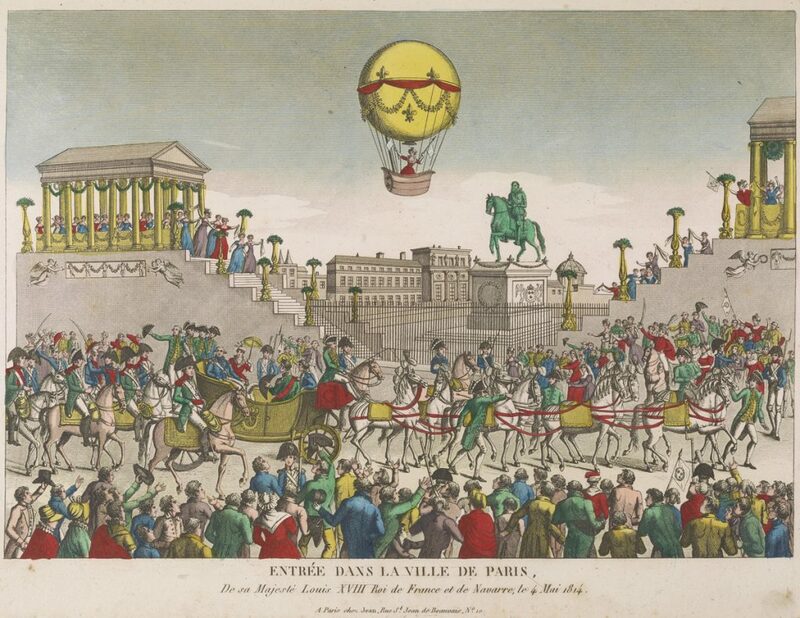 Sophie first took to the sky in 1804 with Jean-Pierre and was immediately fixated with ballooning. Normally shy and nervous, Sophie became a completely different person in the air where she was transformed into an almost reckless daredevil. In 1805, Sophie took her first solo flight and became the first woman to pilot a balloon. Ever the opportunist, hoping to gain financially from notoriety, Jean-Pierre encouraged Sophie to develop her skills as an aeronaut so they could take advantage of her historical status. 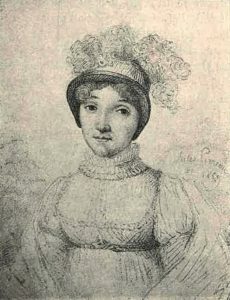 After Jean-Pierre’s death in 1809, Sophie continued her career as an aeronaut, forced in part to do so because of Jean-Pierre’s financial debt. Not only did Sophie take up this challenge, she created her own place in history as France’s Chief Air Minister of Ballooning during the reign of Napoleon Bonaparte. Blanchard replaced André-Jacques Garnerin as the aeronaut to the emperor after Garnerin fell out of favor with Napoleon, which is a story for another time. She continued in a similar role with King Louis XVIII and was named Official Aeronaut of the Restoration. Sophie Blanchard performing at the restoration of the monarchy in 1814, with King Louis XVIII. Image from the Scrapbook of early aeronautica. Blanchard’s ballooning career was a mixture of sensational entertainer, aeronautic experimenter, pioneer, and fixture of the royal court. For her signature style, Blanchard employed a smaller silk balloon than what her late husband used, rode in a silver gondola, and wore distinctive dresses that could be seen at a distance. As an entertainer, Blanchard had a penchant for aerial stunts and pyrotechnics. Her stunts included nighttime flights in which she shot fireworks from pyrotechnic rigs and dropped fireworks from parachutes. Blanchard’s experiments and pioneering aeronautics included long distance and high altitude flights along with parachuting. During her parachute experiments, she would employ dolls and animals as her test subjects. Depiction of the 1819 crash of Sophie Blanchard. Image from Jean-Piere Blanchard, physicien-aéronaute. Her many long distance flights included crossing the Alps and traversing Italy. On numerous occasions, her ascensions reached altitudes of up to 12,000 feet, which exposed her to frigid temperatures and put her at risk of passing out. Temperatures were so cold during her trip to Turin, Italy that icicles formed on her hands and face. Blanchard’s love of ballooning was also her undoing. 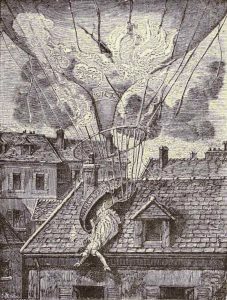 She died on July 6, 1819 when her hydrogen balloon caught fire and she became entangled in the balloon’s netting. Despite her tragic ending, Sophie Blanchard has taken her place in aeronautic history. If you are interested in learning more about the early history of aeronautics and its impact on the 19th century imagination, please visit the exhibition website of Fantastic Worlds: Science and Fiction 1780-1910. The exhibition Fantastic Worlds: Science and Fiction 1780-1910 is currently on view in the Smithsonian Libraries’ gallery space located within One West in the National Museum of American History.